Dallas is on its best run of the season, winning three of four, and an improved defense has been a key ingredient. The next test will come in a Wednesday meeting with Utah, which has beaten the Mavericks handily in two their games this season and has won five straight in the series. Dallas (5-8) has limited its last two opponents, Chicago and Oklahoma City, to 98 and 96 points, respectively, the Mavericks’ two most efficient defensive showings of the season. Throw in Dallas’ lopsided 119-100 victory over Washington on Nov. 6, and it appears coach Rick Carlisle’s emphasis on defense is taking root. “Things are finally starting to come together,” veteran forward Harrison Barnes said. Utah (7-6) has been a nemesis. The Jazz shot 52.5 percent from the field to beat the Mavericks 113-104 in Dallas on Oct. 28 and hit 48.3 percent to win at home 117-102 last Wednesday. Since the last game, however, the Mavericks have tightened up. The Mavs limited the Thunder to 39.2 percent shooting from the field in a 111-96 home victory Saturday and did the same to the Bulls on Monday, when Chicago shot 39.3 percent and made only 8 of 35 3-point attempts in a 103-98 home loss. “I thought the concentration was good. I thought our toughness was there,” Mavs coach Rick Carlisle told reporters in Chicago. Harrison Barnes had a season-high 23 points with five rebounds and four steals and Dennis Smith Jr. scored all 11 of his points in the second half in Chicago, when Wesley Matthews was unavailable because of a left hamstring injury and rookie Luka Doncic was not at his best. Doncic had 11 points on 3-of-12 shooting against the Bulls, but had six rebounds and three assists. Doncic is averaging 19.6 points, 6.5 rebounds and 4.4 assists and could join some impressive company if he continues this pace. Oscar Robertson, Kareem Abdul-Jabbar, Michael Jordan, Elgin Baylor, Sidney Wicks and Larry Bird are the only rookies in league history to average 20/6/4 in a full season. With reserve point J.J. Barea leading the way, the Mavericks’ bench has scored 93 points in the last two games. 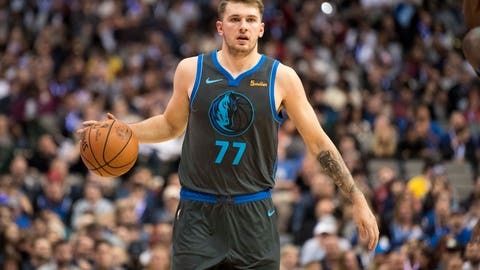 Barea has 35 points, 10 assists and eight rebounds in 46 minutes behind Smith Jr.
“Our bench has been playing great for us all season, so it has been great to see them keep us in games, get us in games, finish games,” Barnes told reporters. Matthews, who is second on the team with a 16.8 scoring average, is considered probable for the Jazz rematch. Utah guard Donovan Mitchell has had 43 points and 11 assists in the two games against Dallas this season, and the Jazz turned 25 Dallas turnovers into 35 points in their most recent victory last Wednesday. The game will feature another matchup of physical centers DeAndre Jordan and Rudy Gobert, who seem to relish the combat. Gobert has 40 points, 26 rebounds and seven blocked shots in the first two games. Jordan has 23 points, 31 rebounds and three blocked shots, and he had a career-high nine assists in the 113-104 loss in October. Jordan and Gobert are 3-4 in the league in rebounding, averaging 13.7 and 13.5, respectively. Utah has won three in a row beginning with its most recent game against Dallas and will be playing the second contest of a five-game road trip that continues in Philadelphia, Boston and Indiana. The Jazz are 5-2 on the road. Mitchell is the Jazz’s leading scorer at 21.4 points a game, and the balanced Jazz have five other players averaging more than 10 points, including sixth man Jae Crowder. They have had five leading scorers in the last six games, with forward Joe Ingles the only repeater. Ingles took four stitches over his left eye after being cut with 3:36 remaining in a 96-88 victory at Memphis on Monday. Ingles was wearing a bandana around his head to cover the cut when he re-entered the game, leading to “Headband Joe” trending on social media in Utah. “That’s what I’ve been striving for my whole life,” Ingles told reporters.